From a missing plane to a vast city hidden beneath Earth, 2014 left many stones unturned. Although we made many discoveries over the course of 12 months, some of them led to even more puzzling questions. Will 2015 be the year our search for answers comes to an end? Here are the mysteries the world will try to unravel in the new year. What happened to the plane that vanished without a trace? A crewman on a Royal New Zealand Air Force P-3 Orion Rescue Flight 795 searches for debris from the missing Malaysia Airlines Flight MH370 on April 1. A Malaysia Airlines flight vanished without a trace while en route from Kuala Lumpur to Beijing on March 8. The weather was clear and there was no distress signal from the cockpit when the plane disappeared from radar screens. A massive search operation combed the Indian Ocean, but the Boeing 777 was never found. After more than nine months, not a single piece of debris from MH370 has turned up. Despite numerous conspiracy theories, we still don’t know what happened to the plane. All 239 people on board are presumed dead. Why is Bardarbunga still erupting? The eruption of the Bardarbunga volcano in Iceland began at the end of August and continues to this day. The volcano has been unique in three main ways: the enormity of its lava field, the amount of hazardous sulfur dioxide gases it has released and the astonishing amount of sinking that has taken place in its crater. Bardarbunga created a 32 square mile lava field, which is the largest in Iceland since the Laki eruption in 1783, and the Icelandic Met Office says it is “probably the third largest lava field on Earth” since 1783. The gases released by the volcano have affected all of Iceland at one point or another, the first time that has happened in 150 years. The Met Office says the amount of sulfur released by this volcano may have exceeded that of any volcano on Earth of this particular type. The eruption has caused the Bardarbunga caldera to sink to 184 feet, swallowing a GPS instrument that had been installed to measure the sinking rate. This is the largest amount of sinking, or subsidence, at any caldera in Iceland in modern times. What caused three deep holes in Russia’s north? A 115-foot hole was discovered in Siberia’s Yamal peninsula — a name that means “end of the world” in the language of the area’s indigenous inhabitants — after an unexplained explosion in July. 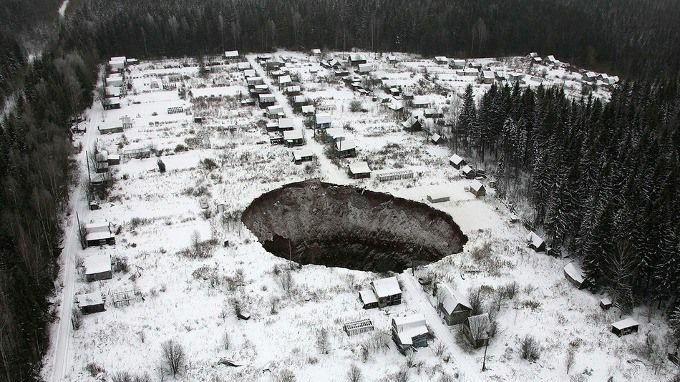 Two other mysterious sinkholes popped up in Russia’s north shortly after. Scientists believe gas explosions beneath the surface caused the sinkholes, but they haven’t been able to confirm that theory. In November, a team of scientists, a medic and a professional climber plunged into the sinkhole to learn more about it, but the cause of the deep holes is still unknown. Was the $10 million treasure actually from a 1901 heist? Buried for more than a century, 1,400 gold coins — worth an estimated $10 million — were unearthed in a California backyard in 2014. The middle-aged California couple who discovered the eight decaying tin cans full of gold remain anonymous. Where did the gold come from? The tale grew even more curious as we discovered that $30,000 worth of similar gold coins — that amount would be in the millions in today’s dollars — had been stolen from the U.S. Mint in San Francisco in 1901. Soon we were all playing a game of whodunit. Former San Francisco Mint clerk Walter N. Dimmick was charged with that theft, but, by the prosecution’s own admission, he was convicted on wholly circumstantial evidence. Despite the fact that the Secret Service searched all over California for those coins, they were never found. But maybe that couple living in Northern California finally did. Did scientists really discover an exomoon for the first time? Researchers have detected the first “exomoon” candidate — a moon orbiting a planet that lies outside our solar system. Scientists think they found the moon of an alien planet, which would be the first time we’ve ever seen an “exomoon.” The problem is that we’ll never really know if that’s what astronomers saw. Researchers discovered the possible exomoon using gravitational microlensing — a technique that detects distant objects regardless of the light they emit — to take advantage of chance alignments between stars. When a foreground star passes between Earth and a more distant star, the closer star can act like a magnifying glass on the more distant one. If that star has a planet whizzing about it, the planet will brighten or dim the light of the distant star. But in some cases, the distant object could be a free-floating planet instead of a star, giving scientists the ability to measure the mass of the planet relative to its companion. In this case, scientists could have spied a small star circled by a planet 18 times Earth’s mass — or they could have spotted, for the first time, a planet bigger than Jupiter teamed up with a moon weighing less than Earth. But because this encounter was completely random, it’s impossible to know if we finally laid eyes on an exomoon. So, the search continues. What is the sprawling structure hidden under the world’s most famous standing stones? Unprecedented underground mapping technology revealed that Stonehenge did not always stand alone. Beneath the 5,000-year-old stone structure is an archeological treasure trove made up of thousands of monuments that include shrines, burial mounds, deep pits and other unexplained features. Stonehenge was previously thought to be a standalone, isolated structure, so this discovery has thrown researchers for a loop. “Stonehenge may never be the same again,” said Vince Gaffney, the project’s lead researcher. And this is just the beginning — the vast majority of information from the site has yet to be analyzed. What happened to the 43 students who went missing? Nearly four dozen high school students disappeared in Mexico after police stopped them from traveling to a protest. The cops then reportedly handed over the students to a drug gang, who investigators say killed them. However, their bodies have never been found. Nearly 80 people have been arrested following the kidnapping, including a mayor, his wife and a local police chief. But without their bodies, the case remains unsolved. What caused the double tornadoes that struck Pilger, Nebraska? The beastly twin tornadoes that leveled the small town of Pilger, Nebraska in June, killing two and injuring nearly two dozen, were a horrifying, relatively rare phenomenon. Both of the twisters were rated at EF-4 intensity on the Enhanced Fujita Tornado Damage Scale, with winds as high as 200 miles per hour. One of them went directly through Pilger, while its twin spun itself out to the east of the town. The sibling tornado damage tracks were visible from space, where a NASA satellite spotted what look like nearly identical scars on the Earth’s surface, separated by about two miles. There are many things scientists still don’t know about tornadoes. For example, they still don’t know exactly why some severe, rotating thunderstorms, known as supercells, produce tornadoes while other nearly identical storms do not. The Pilger tornadoes demonstrated another unknown — how some storms can spawn multiple violent tornadoes at the same time.